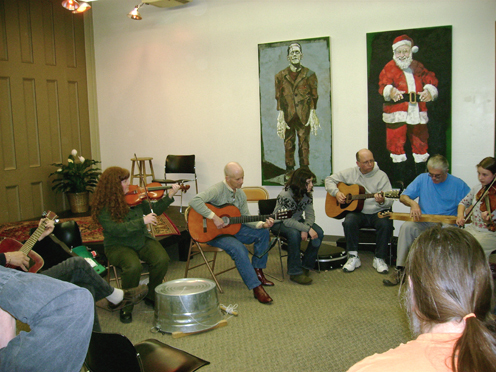 it is a community of people sharing an interest in the preservation of traditional music and related arts. Listeners and musicians alike can find a comfortable place in volunteer activities, sharing music during a jam, or in a dish-to-pass supper before a concert. Most concerts are held at 144 Cedar Street (corner of Cedar and First Streets, in the First United Methodist Church) in Corning, New York (click here for directions). Saturday concerts begin at 7:30 pm and Sunday concerts begin at 2 pm, unless otherwise specified. There is a self-running jam on concert nights beginning 90 minutes before concert time when we get in the building to set up for concerts. Bring your instrument and come jam with us! We need your help to promote Valley Folk concerts. Can you volunteer to list Valley Folk concerts in a few on-line calendar listings once or twice a year? Other examples include on-line calendar listings, getting our concerts listed in newsletters with which you have an affiliation or hanging posters in public spaces. Most of all, we need you to invite friends and neighbors to concerts – word of mouth is the best form of advertisement. Show your favorite performers your appreciation by volunteering to bring them a light meal before the performance or to provide them a picnic to take on the road. We ask people to bring finger foods - sweet or savory - for the intermission snack buffet. Some recent popular snacks have been: hand baked bread and farm-made goat’s cheese, veggies and interesting dips, cut up fruit, homemade cookies, brownies, banana bread, Cheese and crackers, anything chocolate, shortbread and scones for Scottish music, nuts, fancy bakery items. Volunteer to host your favorite performers overnight after the concert. If you have a bed or two in an under-utilized bedroom (perhaps it's now a home office with a spare bed or the room your kids used before they went to college? ), and can provide a simple breakfast, please volunteer. We occasionally get requests from musicians with allergies for homes without furry pets, so if that describes you, we would be especially pleased if you would consider volunteering your spare bedroom once or twice a year. These concerts used to be made possible by a grant, and we need a volunteer that can write a grant proposals to help us secure funding for the future. Meanwhile we rely on donations from generous people. Valley Folk welcomes businesses to help financially, or in-kind by providing food or lodging to musicians, in exchange for advertising. Mike Harding BBC Radio Show - podcast of archived episodes. U. Utah Philips radio show - archived episodes. 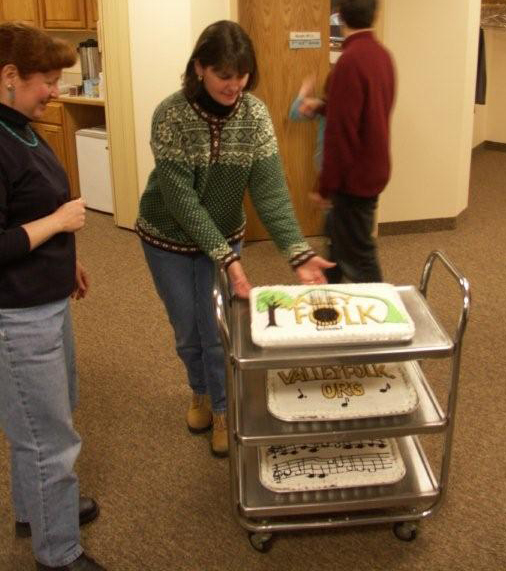 Michelle Halperin wheeling cakes she baked to help us celebrate our logo and website.